In a sign that its Chromebox for Meetings videoconferencing solution is alive and well, Google unveiled a boatload of new features and capabilities, all designed at luring businesses to its Google Apps platform. Google said Tuesday that it would bring its Hangouts videoconferencing service underneath its Service Level Agreement, putting it on a par with its Google Apps like Gmail, Docs, and Drive. And in recognition that Google+ doesn't enjoy the same status as it once did, Hangouts can be connected to Google accounts that haven't signed up for the social networking service. Since Google unveiled its Chromebox for Meetings videoconferencing solution this past spring, the company has remained relatively quiet, not even allowing PCWorld a chance to formally review the hardware. Chromebox for Meetings includes four components: either the $179 Asus Chromebox or a similar device from HP, both based on the Intel Core i7 chip; a 1080p HD camera module; a combination microphone/speaker; and an RF remote control. 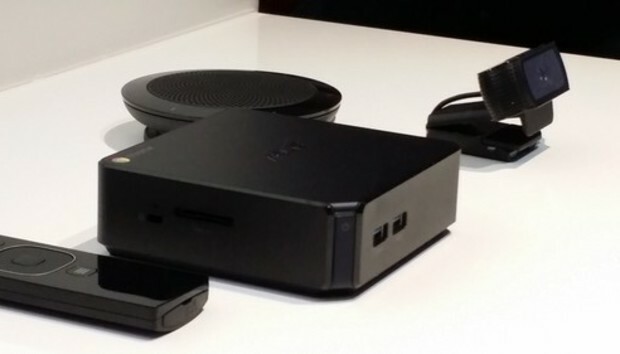 In the coming months, Google said, Dell will launch a Chromebox designed for its Meetings platform as well. Google hasn't formally disclosed the price of the entire system, but an additional $250/year management fee covers the SLA agreement and future software updates. In the coming months, Google will expand the new Chromebox program from the United States, Canada and New Zealand to the United Kingdom and Japan. That SLA, Google said Tuesday, now includes 24x7 phone support and a 99.9 percent guaranteed uptime as well as ISO27001, SSAE 16/ISAE 4302 and SOC 2 certification. Later this year, Hangouts will be archivable to the Google Apps Vault, which has currently served as an email archive for e-discovery purposes. Up to 15 people can join each Hangout, which now can be connected to those with or without a Google+ ID. Google also added capabilities to those who haven't yet migrated within the Google ecosystem: BlueJeans, for example, will allow those on H.323 or SIP networks to join a Hangout via their phones, and Hangouts now supports audio conferences via the bridge as well. Soon, Android phones and tablets will also be supported--a feature that rival Skype supports, but just via voice at the present. Admins will also be able to start, mute, and hang up meetings remotely. Besides the disclosure that Dell would be manufacturing a Chromebox, Google didn't offer many updates on the hardware front. One, however, is fairly important: Given that many Chromeboxes support more than one display output, dedicating one monitor to a presentation and one to the conference itself is a nice addition. For those who choose to hold those "meetings" at home, with friends, the Google service now supports personal calendar integration. In our experience, Skype tends to be preferred for direct video calls, but Hangouts provides an easy way for groups to get together. Google clearly wants to exploit this advantage further.